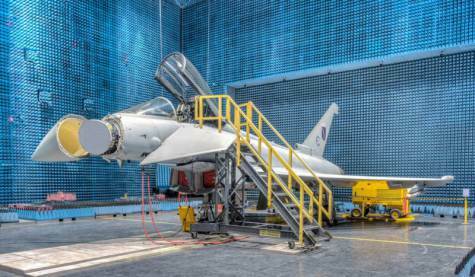 ULM, Germany --- The Eurofighter will be equipped with a new generation of radar which will enhance the aircraft's capabilities and survivability. In the Euroradar consortium, the sensor solutions provider Hensoldt is pressing ahead with the development of the Eurofighter's new Captor-E radar system. The Captor-E radar is based on AESA (Active Electronically Scanned Array) technology and will significantly enhance the performance of the Eurofighter. Electronic beam scanning combined with flexible radar resource management provide outstanding detection performance and ensure simultaneous multi-target tracking, missile guidance and perception of the situation. The Eurofighter's nose is larger than that of all the comparable fighters, which means that the antenna is much larger and consequently more powerful than that of competing aircraft. This, together with the ability to mechanically rotate the antenna with a larger angle of view, increases both the detection area and the field of regard in comparison with the AESA radar systems used by the competitors. The further development of radar technology is one of the main focal points of the sensor specialist Hensoldt. For this reason, Hensoldt operates one of the largest cleanroom production lines for radio-frequency components in Europe. Hensoldt's radar systems are deployed worldwide by armed forces, including the US and German Navy, as well as at the bases of the Canadian, Australian and German Air Force. The Eurofighter radar is being developed by the Euroradar consortium comprising Leonardo (Great Britain, Italy), Indra (Spain) and Hensoldt (Germany). The consortium has already developed and produced more than 400 Captor radars.